At the end of a year, journalists and others are inclined to write optimistically about the hope for the next New Year. Who wants to be depressing at the start of something new? Unfortunately, we are living in a new dimension ruled by the US President-elect, T-Rex (see previous ieBLOG), and his close companion, RasPUTIN, the President or Czar of Russia. Here are two wild and crazy guys who seem to have bonded, even though they actually have not met in person. They enjoy bullying and boasting, and enjoy hanging around with the well-to-do, the one percenters. One has short hair, the other more than enough for both, though orange. Like the fuel sources they champion — oil and gas — they are fossilized, living in dark regions polluting the earth with their political emissions, including tweets. With T-Rex and RasPUTIN dominating two of the most powerful nations, the reality is that 2017 very likely will be disruptive, unsettling, depressing and dangerous. Just for one example, it is certainly possible, if not likely, that they will collude to put part of the Arctic at great risk from drilling and producing oil and gas, assisted by another Rex, Tillerson, as the new Secretary of State. The fossil fuel companies and their stakeholders will reap the benefits. 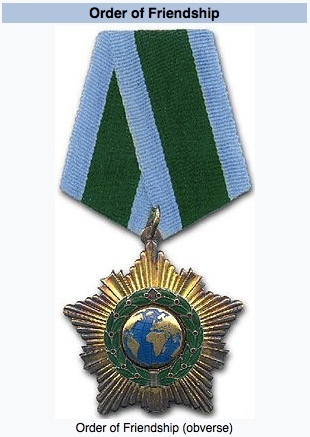 Tillerson, the CEO of ExxonMobil, received the Order of Friendship from RasPUTIN and presumably T-Rex might also receive such an honor from his pal. T-Rex does love attention and shiny objects. While all this may spell disaster, there is some good news in the wind. Whatever inane, confused, or patently false statement T-Rex offers, he most likely will contradict it within days. Words on one day have no relation to words on the next or any other day; meaning evaporates. Those in the international community, and even his Republican colleagues, likely will soon learn this lesson, if they haven’t already. This will of course cause some consternation among his Cabinet since they won’t be able to figure our what his policy or position is. The best advice for when T-Rex ascends the throne in several weeks is to ignore whatever he says. But under no circumstances ignore what he actually does. His policies, as opposed to his words, do have consequences. We need to nail down his policies and attack those that threaten our environment, and other social and economic benefits. Don’t let him avoid the meaning and impacts of his policies. Lastly there is no use getting angry at T-Rex. But do get even by making fun of him. As the comedian Seth Meyers and President Obama did at the White House Correspondents dinner in 2011 over a possible presidential run by T-Rex. Or as Alec Baldwin does in his imitation of T-Rex on Saturday Night Live. T-Rex was not amused by Meyers or Baldwin and he showed it. Some have suggested he was humiliated by the Meyers roast. But then Trump humiliated himself when he failed to carry off any humor at the 2016 Al Smith dinner in New York, and was even booed by the audience of the New York elite. T-Rex has very thin skin and retaliates whenever he feels slighted. So if we’re lucky RasPUTIN will offer T-Rex some slight that nobody else will perceive, and T-Rex will pout and then Tweet and then turn elsewhere to get some attention. Perhaps Nigel Farage can re-establish that “special relation” between the US and UK and T-Rex can be knighted. Or T-Rex can get a role on Games of Thrones, returning to his strength and origin in pure fantasy TV. John Goodman as Rex Tillerson, Beck Bennett as Putin, and Alex Baldwin as T-Rex, examining drilling sites in the Arctic.